In Paklenica there is mainly limestone of karstic origin. It is very firm although sometimes quite sharp. In the entire area there are numerous routes of all difficulty levels and all lengths. The greatest number of short sports dimbing routes is opened in the narrowest part of the gorge, so called Klanci (that part of the climbing site, considering the fact that its easily accessible is also suitable for small children). Most of the slabs are vertical or slightly oblique with small sharp handholds, mainly flakes. 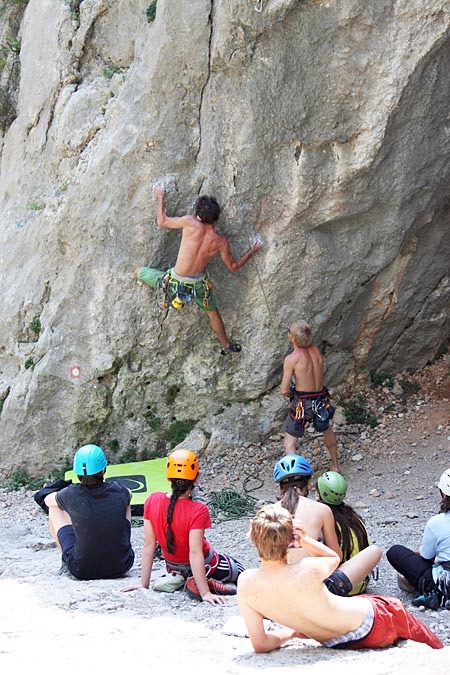 Recently in Paklenica there have been developed some sections with oblique, athletic routes on the reddish rock face covered with stalactites. One of them, Crljenica is also suitable for climbing in the winter period. Klanci are overarched by Kukovi ispod Vlake, Debeli kuk, Kuk od Skradelin and Ćuk. In these rocks we can find longer routes, mostly of beginners level, and several new, more difficult routes. 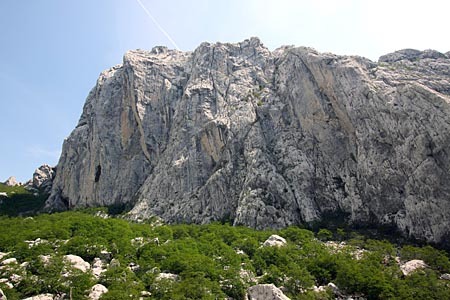 Definitely the most famous rock in Paklenica is Anića kuk. Here we can find routes of different characteristics: ranging from the ones with no in situ gear on the routes, aided routes to modern long sports climbing routes. The latter ones are lately becoming sort of a “specialty” that Paklenica has to offer. Routes in Paklenica vary when it comes to how well are they equipped. The old routes are equipped with pegs and the newer ones with bolts. A lot of classic routes have already been reequipped, and a lot of them are about to be reequipped. It is strongly recommended that you take a set of nuts and friends and few slings with you, except when it comes to some new routes that are fully equipped. Rocks in Klanci (gorge) mainly face west and east. Anića kuk faces north, northwest and partly west. Routes drawn in the diagrams are numbered clockwise from the left to the right. Next to name of each route, its grade there is also the approximate altitude. If the routes in question are longer there are also grades for particular rope lengths. Sometimes the grades can be found on the very diagrams. Name in parentheses refer to the first ascents. First there is a grade for free ascent and then in the parenthesis, in some case a grade for a classical ascent. Grading is based on a French scale. There are possible differences in criterions of grading particular routes. It is also possible that grades in some, less climbed routes are unrealistic.